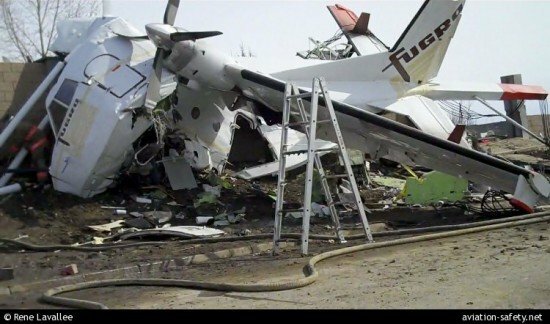 The Transportation Safety Board of Canada (TSB) released its investigation report into the 1 April 2011 crash of a CASA C-212 aerial survey aircraft, operated by Fugro Aviation Canada, in Saskatoon, Saskatchewan. The crash was caused by a mechanical failure in one engine followed by fuel starvation in the second engine. During a geophysical survey flight east of Saskatoon, an internal component in the right engine of the Fugro CASA C-212 failed, causing the engine to lose power. The crew of three then completed the engine failure checklist, stowed the survey equipment and turned toward the Saskatoon airport. Fourteen minutes later, with the aircraft just short of the airport, the left engine lost power. The aircraft impacted a concrete noise abatement wall as the crew executed a forced landing adjacent to a road. The survey equipment operator was fatally injured, the first officer was seriously injured, and the captain suffered minor injuries. The aircraft was destroyed. The left engine lost power due to fuel starvation. Investigators found debris in a fuel pump nozzle, which reduced the amount of fuel the pump delivered to the left collector tank. Fuel depletion in the left collector tank caused the engine to shut down while usable fuel remained in the left inboard tank. Additionally, the fuel crossfeed valve remained closed, which meant that the left engine was only receiving fuel from the left fuel tank, rather than from both tanks. Following the accident, the company improved its CASA C-212 one-engine-inoperative emergency procedures and equipped similar aircraft with a cockpit-operated cable cutter to immediately jettison deployed survey equipment during an emergency. This will provide an additional safety defense against fuel starvation and allow for better aircraft performance when one engine is inoperative.